Organizations can vary in the way they are organizationally structured. The structure of an organization is very important for achieving maximum productivity, managing individual work needs and reaching of corporate goal and objectives. An organization’s structure consists of the method that an organization employs to delineate lines of communication, policies, authority and responsibilities. It determines the extent and nature of how leadership is disseminated within the organization. It is the method to ensure effective channels of communication. There are two types of organizational structures which are usually adapted by the organizations. 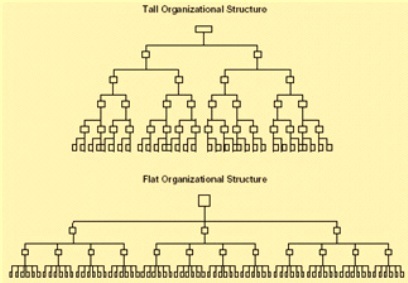 Organizations either have a hierarchical or flat structure. The type of structure chosen by an organization is determined by several factors. These include size of the organization, employee’s skill, leadership style, business objectives, and technology employed etc. Hierarchical organization is also known as a ‘tall structure’. It is characterized by a large number of layers between top management and the lower ranks of the organization. It has an organization structure that follows the layout of a pyramid. In such organization, every employee in the organization, except one, usually the Chairman, MD or CEO, is subordinate to someone else within the organization. The layout has multiple entities that descend into the base of lower rank level employees, who occupy the bottom of the pyramid. Hierarchical structure is normally adopted by large organizations. A flat organization (also known as horizontal organization) structure is an organization structure in which the organization has a few or no levels of middle management between executives and staff. There may be only one layer or a few layers between the top of the management and the lower level employees. Flat structure is usually adopted by the smaller organizations. A comparison of the two types of structures are shown in Fig. 1. The terms hierarchical or tall and flat are relative terms, and the size of the organization in question must also be considered when assessing its inherent structure. Therefore, organizations should be compared to other organizations of similar size and specialization to determine how much hierarchical or flat is their structure. Thus for an example, the organization structure of an integrated steel plant can be compared with that of a steel foundry to determine how tall or flat the organizational structure is. A hierarchical organization links employees either directly or indirectly, and either vertically or horizontally. The only direct links in such organizations are to one’s immediate superior or to one of one’s subordinates. All parts of the hierarchy that are not linked vertically to one another nevertheless can be ‘horizontally’ linked through a path by traveling up the hierarchy to find a common direct or indirect superior, and then down again. Hierarchical organizational structures are tiered arrangements that generally include many layers of management between top executives and employees. Organizations with hierarchical structures have low manager-to-employee ratios. This translates to high manager involvement with employees since each worker doesn’t have to ‘share’ a manager with many other employees. This allows managers to closely oversee and manage employee performance. Hierarchical structures within organizations also tend to encourage employees to fulfill overall corporate objectives over individual ones. The following are the advantages of the hierarchical organization structure. Within the organization employees recognize defined levels of leadership along with their authority and levels of responsibility. Communication gets channeled along defined and predictable paths since employees know who reports to them and whom they are reporting. A clear chain of command is available in the organization and this generates a clearly defined set of responsibilities. Opportunities for advancement in career are available that motivate employees to perform well. Hierarchical organizational structure promotes development of the employees as specialists. It is possible for the employees to narrow their field of focus and become experts in specific functions. Hierarchical organizational structure has a number of disadvantages also. These are given below. Hierarchical organization structures work for standardized processes but they are not useful in dynamic environment. They are slow to react to new opportunities which often need transformative changes. Rivalry between departments may inflame as each department makes decisions that benefit its own interests rather than the organization as a whole. Increased bureaucracy often hinders an organization’s speed to change. Hierarchical organizational structure inhibits timely transformation, which is essential if the organization’s business is to survive in a rapid changing environment. Increased time is required to respond to clients since decision making is usually slow in the hierarchical organization structure. Salaries for multiple layers of management increase an organization’s costs. The structure of an organization has a significant influence on employee behavior. The hierarchical organization structure places limits on the responsibility and authority of individual employees, which reduces an organization’s ability to adapt to dynamic business conditions. A command-and-control hierarchical organization structure might work well in a crisis but it is of limited help after the crisis is over. A flat organizational structure eliminates middle management and adopts a more casual, people-powered approach to running a business. It is a natural choice for many small organizations. The lower number of employees and a more concentrated work focus makes it easy to manage the business in such organization without a more complex hierarchical structure. However, once businesses start expanding into multiple business functions, product lines or geographic locations, the scope of the workload generally calls for a more formal organizational structure. As a result, organizations that opt for a flat organizational structure long term can run into difficulties growing and managing employees and achieving product consistency. The flat organization structure has less supervision of employees and promotes their increased involvement in the decision-making process. The following are the advantages of the Flat organization structure. It empowers the employees more and elevates their level of responsibility. It gives the employees more autonomy in the organization. It removes excess layers of management and hence it has a short chain of command. Because of this the coordination and speed of communication between employees is improved greatly. Fewer levels of management encourage an easier decision making process among employees. Because of decentralized decision making process, the involvement of employees gets promoted in such organizations. Employees in a flat organization structure are encouraged to work together to solve organizational issues. Expected response to customer feedback is more rapid in the case of flat organizational structure. With the elimination of the salaries of middle management, the organization’s budget cost is reduced. Since flat structures provide for minimal supervision over projects and tasks, employees usually experience more freedom, which can translate to more independent thinking and higher levels of creativity. Flat organizations provide greater need satisfaction for employees and greater levels of self-actualization. Flat organizational structure has a number of disadvantages also. These are given below. Employees in flat organization structures can also feel more ‘role ambiguity, within their organizations as workers can be uncertain of job expectations. In a flat organizational structure, there is very little room for employees to move up. This makes it harder for ambitious employee to find satisfaction. Some employee enjoys working hard toward a promotion, and there is not much opportunity for this in a flat structure. Flat organizations tend to produce a lot of generalists but no specialists. Flat structure may limit long term growth of an organization since the management may decide against new opportunities in an effort to maintain the structure. Flat organizational structures cause the brunt of the managerial responsibilities to be performed by one person. While a singular control point increases consistency, the managerial workload can be overwhelming and increases stress. Too much responsibility results in missed deadlines, uneven managerial oversight and poor employee support. One manager overseeing numerous employees decreases the amount of work oversight and number of review opportunities. These lower control levels are a boon for creativity and place more decision-making power in employee hands. But this flexibility can result in quality control problems with the finished product. High quality products generally need more instances of management review. A singular manager in a flat organization would struggle to support numerous reviews.